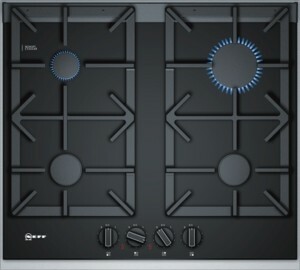 The NEFF T26TA49N0 Gas Hob on black ceramic glass with a stainless steel trim will give your kitchen the modern look while being easy to clean. There are 4 hobs on two cast iron supports made up of 1 high speed burner, 2 standard burners and 1 economy burner for all types of different pots and pans. The cast iron pan supports are sturdy and robust, great for everyday use with heavy pans and hot flames, they clean up easily and add a look of style to your kitchen. Ignition is automatic via the front control dials where you can manage the heat of the gas. A flame failure safety device will cut the gas supply if the flame is accidently blown out for your peace of mind.